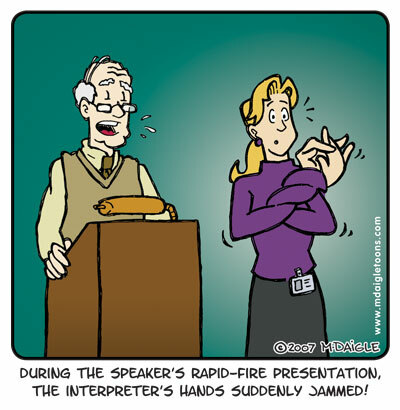 This page features the artistic talents from the husband and wife team Matt and Kay Daigle and the cartoons/comic strips that give insight into life in the Deaf world. Matt and Kay Daigle have been comedy partners since 1993 when they met and were cast in a Deaf/Hearing touring theater company together. After touring a year with the company Matt attended Northern State University in Aberdeen, South Dakota and received a degree in Advertising Design. Kay went on to get her Masters Degree at Gallaudet University in Interpreting while Matt toured with the Tony award winning, National Theater of the Deaf. It was during that trip that Kay approached Matt about writing the comic strip “That Deaf Guy.” Kay having worked as a comedy actress for over 15 years in theme parks, theaters, and variety shows had learned how to write for sketch comedy and wanted to try her hand at writing for cartoons. 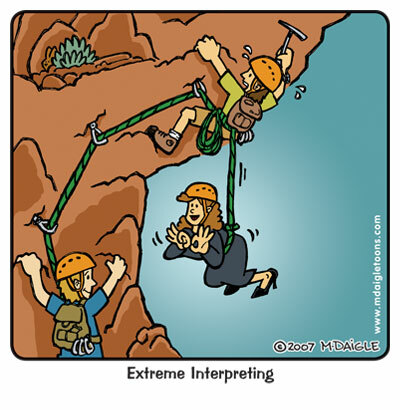 Matt having already an established cartooning career with his single panel cartoons “In Deaf Culture...” “Extreme Interpreting” and “Deaf Reel” made for the perfect match. 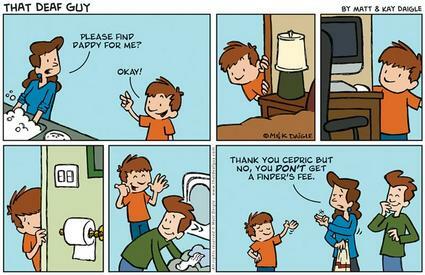 The result was a cartoon about everyday life with a mix-lingual family, a deaf guy, hearing wife, and CODA son and how life can be really funny when you throw them all together at home and into the world. 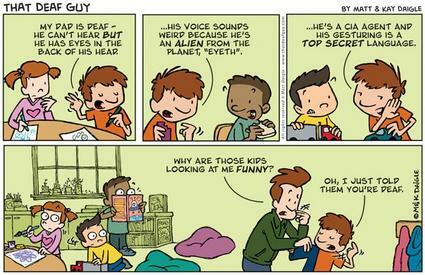 “That Deaf Guy” made its webcomic debut November 2009 and receives roughly 42,000 hits a month. 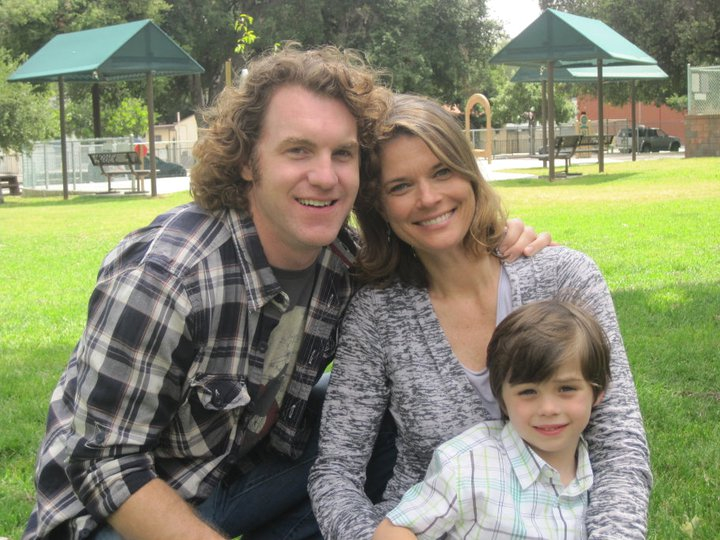 Kay and Matt have been married for 16 years and live in Burbank, California with their son Hayden. I would like to thank Matt and Kay for sharing their bio information, picture and artwork with Signs2go Interpreting & Support Services, LLC. Follow the links below to view more of Matt and Kay Daigle's work.